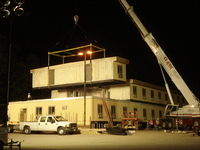 Modular Buildings | C&B Modular Inc. Engineered Solutions by C & B Custom Modular, Inc.
At C & B Custom Modular, our focus is on the needs of each individual client. We work with our clients to develop the right engineered solution for each project. With over 20,500 successful projects completed, we have the experience it takes to see your project through, from start to finish. From Educational modular facilities, to specialty buildings for oil field service companies and everything in between, we have the engineered solution for every application. Whether you need a large, custom designed modular building, or a small portable office, we have you covered. Give us a call today and let us design the perfect solution to your instant space requirements. Environmentally sustainable building construction has experienced significant growth during the past 10 years. The constructed building environment has an extensive effect on human health, the natural environment and the economy.